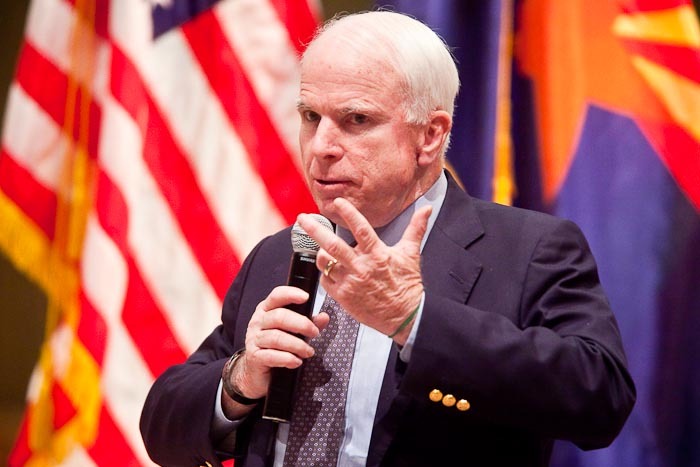 Sen John McCain had a town hall meeting about health care at North Phoenix Baptist Church this evening. Most of the 200 or so attendees were medical professionals from Phoenix area practices and most supported McCain and his take on health care reform. The Senator called the Democrats’ proposal, HR 3962, a jobs killer that would lead to rationed health care. It’s the same argument Sen. Mitch McConnell used on the weekend talks shows. If I didn’t know better, I would suspect the McCain, McConnell et al of colluding on their “talking points.” Certainly they’re capable of independent thought? Aren’t they? We already have health care rationing here. That’s what happens when the insurance companies deny life saving coverage to their customers. And then delay the appeals process so long their customers die. There are certainly reasons to be concerned about the Democratic health care proposal. It’s really expensive and doesn’t cover all of the people who need coverage. But I think it’s better than the Republican plan. The Republicans want to leave health care to the market and insurance companies to fix. Leaving it to the market is how we got into this mess.